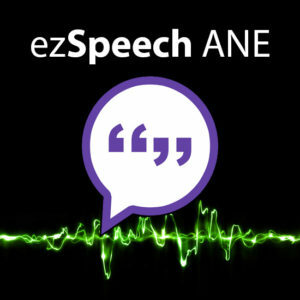 Brings Speech To Text to AS3 mobile games and applications. Bring the power of voice recognition to your mobile projects. 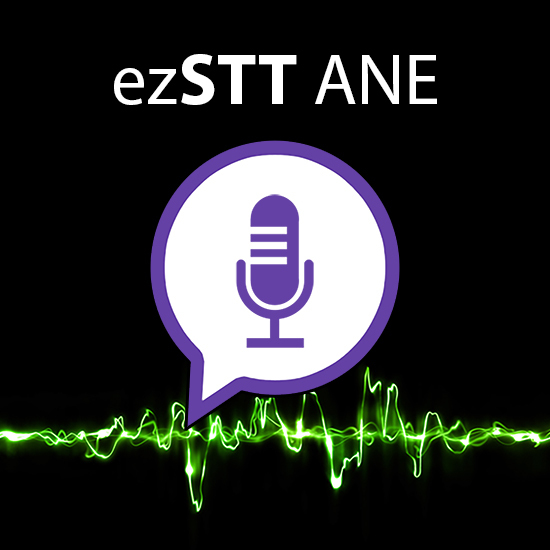 With ezSTT ANE, your application can ear and understand your users. Apple and Google works with cloud services for Speech Recognition. This extension use the online Speech Recognition service provided by Google and Apple. In a few lines of code, ezSTT ANE will give natural recognition of the language to your games or applications. First, you need to download or fork ezSTT AIR Native Extension project on GitHub. The ANE library (ezSTT.ane) is located in the ‘bin’ folder. You should add it to your application project’s build path and make sure to package it with your app. Under File > Project Structure… > General make sure your project type is ActionScript (or Flex) for AIR mobile platform. You can use Change.. to have the correct type. On each of the platform tags you can generate a custom app descriptor or use the IDE generated one. You can use one for all platforms, or create one for each platform. The application descriptor already contains the Android manifest and/or the iOS plist inside. You can set it up exactly like for the Flash Builder when using the custom app descriptor. Now you’ll know what easy means. Import, instanciate, add event listeners, test and start to use. Everything is done in a few lines of code! On both systems, this ANE use the Speech Recognition Cloud API (juste like Siri and Google Agent). You have to ensure you have a connexion to internet. If you want to do offline Speech Recognition, you have to ensure that appropriate language packs are installed (In Settings > Languages > Speech Recognition > Offline). There is actually no way to do this programmaticaly. On both systems, you have to ensure a proper STT engine is installed and selected by default to enforce a specific language. This function is EXPERIMENTAL. If device operating system doesn’t match the minimum requierements, “isSupported” method will always return false. There is a complete Feathers 3.3.0 & AIR 26 sample project in the ‘example’ folder. It was created with Flash Builder 4.7. Feel free to test it and adapt it for your own needs. text="TEST A COUNTRY CODE (AT YOUR OWN RISKS)"
You can access the complete asdoc in the ‘doc’ folder. ezSTT ANE is developped by Fabrice Montfort. All rights are reserved. Feel free to ask for an Ad in this section. If you want to use in a production project, you have to purchase the full version. You will be able to download an archive with the full production version from your account on this website after your payment has been validated. This is a lifetime license, valid for all your projects. You will benefit from all updates without restrictions. If you have any question, comment, or suggestion, you can leave me a message on Github. I’ll give you a quick answer. I made the choice to centralize all trade questions and answers on GitHub so that they can serve all users.